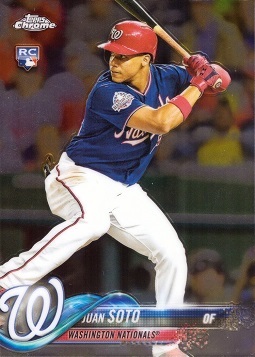 This is an official Juan Soto Rookie Card, produced by Topps Baseball in 2018. In the upper left corner region of the card you will see the official RC logo, indicating that this is a true Rookie Card. This card can only be found in 2018 Topps Update Chrome packs sold at Target stores.